Today in Health class, we learned how to brush our teeth properly. We had visitors that are dental hygienists from the Health Unit that talked to our class and showed how to take care of our teeth and keep them clean. We all got a toothbrush and a timer to take home to brush our teeth twice a day. 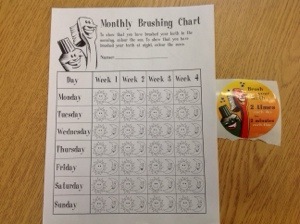 They also gave us a tracking sheet to help us remember to brush twice a day.